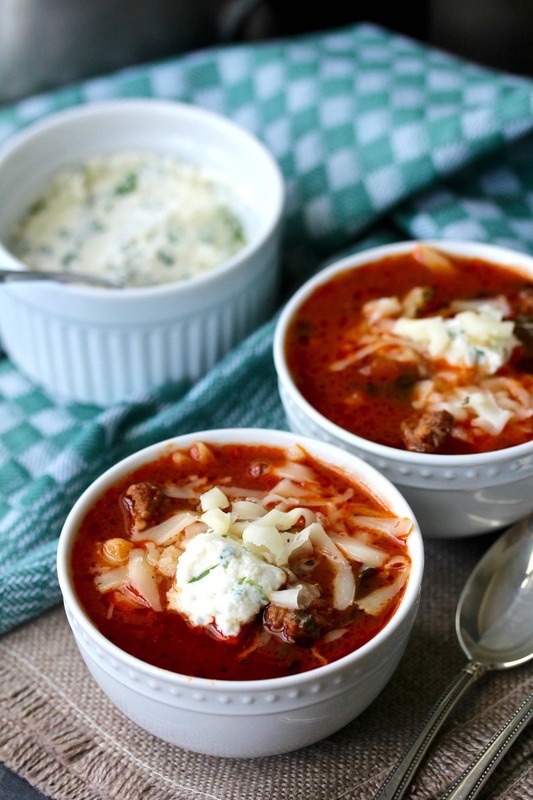 This Slow Cooker Lasagna Soup tastes just like your favorite Italian layered casserole, but with less than half of the calories. 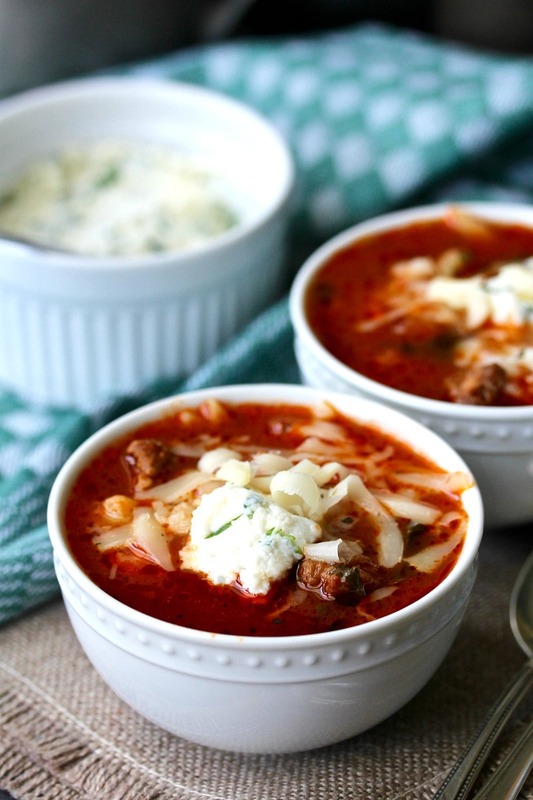 This Crock-Pot Lasagna Soup includes hot Italian sausage, marinara sauce, lasagne noodles broken into pieces, and a topping of ricotta mixed with parmesan and parsley. I also sprinkled the top of the soup with some shredded mozzarella cheese to add to the creamy and cheesy deliciousness of this soup. If I was forced to pick a favorite dish, lasagna would be on my short list. I love the layers of cheese, spicy sausage, and the tomato sauce. This soup includes all of the flavors of lasagna, but without all of the calories. Plus, it's so easy to make in the Crock-Pot! For the marinara sauce, you can either use homemade or store-bought. This soup is also loaded with two cups of fresh spinach, which would make Popeye (tell me you know who Popeye is!) happy. This month, the Soup Saturday Swapper group is making soups in the slow cooker/Crock-Pot. After the recipe, be sure to check out the rest of the slow cooker soups. Mix the topping ingredients (ricotta, Parmesan, and parsley) and refrigerate until ready to serve the soup. Heat a 12 inch skillet over medium heat. Add the sausage and cook, breaking it up, and cook for 3 to 4 minutes. Add the onions, garlic, and continue to cook, stirring, for another 3 to 4 minutes. Transfer the mixture to a slow cooker. Add the broth, marinara sauce, parsley, bay leaves, and pepper. Cover the slow cooker and cook on high for 3 1/2 hours. At 3 1/2 hours, remove the bay leaves and add the spinach and lasagna noodles. Cover and cook for an additional 30 minutes. Serve the soup, topping with the ricotta mixture and a sprinkling of the mozzarella, basil, and red pepper flakes to taste. I love lasagna too. I definitely have to try this soup. Thanks for sharing and for hosting this month Karen. Lasagne is on my short list, too! Making this soup will be a real treat! Thank you. Perfect theme during this warm spell. I made this about a month ago when it was still "June-gloom" here. It was definitely a big hit with all of my taste testers =) Fortunately, my husband will eat soup any time of the year! 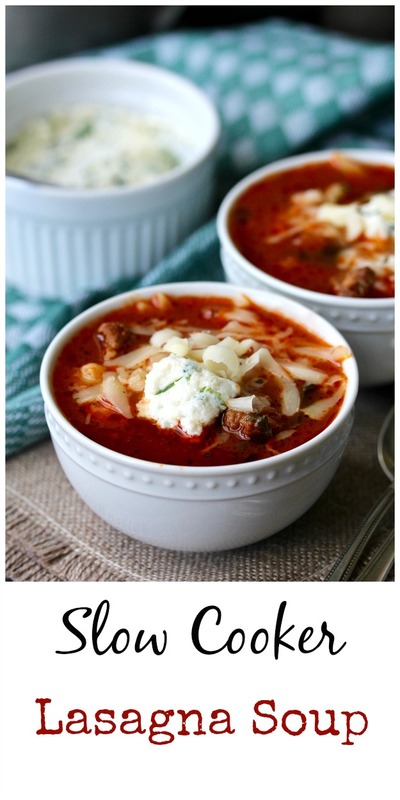 I'm the soup eater in my family but hubby loves Lasagna, and I think I'll try this out on him when the weather is cooler. At 80 degrees and 89% humidity at 7 am, it's not exactly soup weather here. Thank you!! I shared your link on FB and pinned it too.